Working with a startup client to Improve SEO on a Subscription Based Products site, added text from marketing emails to the blog as weekly news posts (going back 25 weeks) to retroactive emails as fresh content. 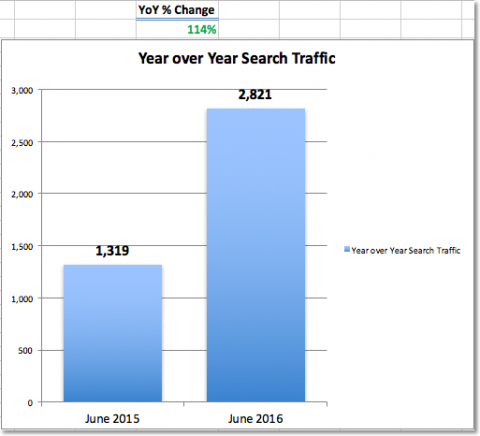 The result was a 114% gain in search traffic measured Year over Year. Gains were also made by including Schema.org markup on a large percentage of site content, gaining photos in more detailed search results, improving click-through rates. Worked with a Super Bowl Video Collection uploaded in real-time during the game, writing better titles, video tags and content descriptions produced a more than 10X increase in Y-o-Y views on Super Bowl Commercials video and maintained ongoing traffic after the event. Adding social media tools to the video player increased sharing, embeds and external links dramatically. Ran a national test to increase Google News Visibility working with a dozen local television stations on a managed national platform working with local web producers to write headlines that were more focused on likely search keywords for news events. Increased search engine click-through traffic by 105% immediately for the sub-group that worked outside the normal workflow. Non-participating stations saw no increase to their normal news search traffic during the test. Seasonal content produced a yearly spike driving search traffic to non-monetizable PDF files. We added a layer of useful information-rich landing pages with advertising slots which doubled traffic and produced 35% new incremental income on that traffic. Worked with a team to build a Strong Platform Architecture organized around unique content, made search friendly for a half-dozen high-profile publishing partners at national news organizations and media companies. The hosted sites all outperformed original estimates for search traffic by double digits. Ran a large-scale test to compare search referral traffic to pages with keyword focused URLs versus ID# only and found a 9% increase in search traffic when keyword URLs are used. Long term improvements continued after updates, producing double digit gains in search traffic to test pages. Worked on 3 separate Site Rebuilds and Relaunches where URLs were preserved, even though each site was on a new platform – all saw 30% to 40% gains in traffic after relaunch due to site architecture improvements and maintaining existing URLs. This is opposite the normal 45% to 60% drops in search referral traffic seen in site rebranding, relaunches and redesigns. Worked with a dozen Partners on a Hosted Ecommerce Platform with our team to build search friendly site architecture and incorporate Schema meta data. Tools to edit all SEO variables were incorporated into the platform backend and used to build partner sites. Repeatedly met partner SEO needs by iterating that platform to perform better as search algorithms and web standards evolved. Looking Forward – Technical SEO Iteration, which was key to each of the above, while current evolution points toward full Secure Encrypted https as a search ranking factor, working with all clients to move toward that transition where they have not already done so. In addition, Accelerated Mobile Pages move every platform, especially mobile commerce, toward near instant page loads, with no perceptible lag time to load browsers with all critical information instantly.